Be 1 of the 3 lucky winners of SuperStar Virgo Cruise for 2! 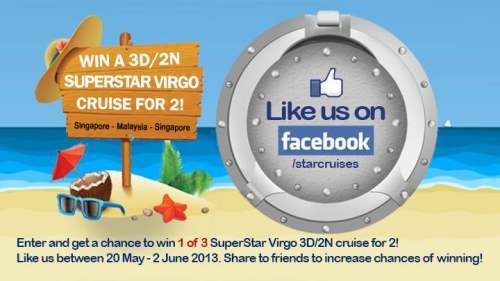 This Promo entitles Star Cruises Fans to get a chance to win a 3D/2N cruise for two (2) onboard SuperStar Virgo. Cruise prize includes accommodation to an inside stateroom cabin, meals in inclusive restaurants, world class entertainment, use of recreational and gym facilities, passenger handling charge and fuel surcharge. Fill up this form and you're on the way to win a SuperStar Virgo Cruise for 2! Do you like Star Cruise contest?